Presented by Connie Orbach, Graihagh Jackson. Remember that time that Ginny made Kat eat chocolate spread from a nappy? Or when Georgia broke the drone? 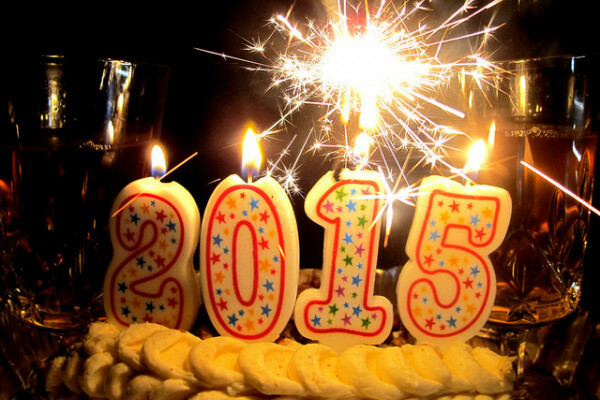 It's the end of 2015 and what a year it's been for science! Whilst Chris and Kat take a well deserved break, producers Connie Orbach and Graihagh Jackson have hijacked the show to take you through all their favourite bits of the last 12 months. 01:25 - The beginning of everything? This year we tackled some pretty big questions, like when Graihagh Jackson asked, when did time begin? Huw - Many cosmologists now think that there is. This view goes back to a discovery that the universe is expanding, a discovery made in the 1920s. Logical implication of that is that there must have been a time when it was at minimum size and that's what we now think of as the Big Bang. On most views, that's the beginning of time. There's literally nothing before that. Graihagh - Basically, with the Big Bang, time was created. Time didn't exist before the Big Bang because well, the Big Bang created time. Armed with the best physics in the 20th century, Albert Einstein came to a very similar conclusion with his theory of relativity which states that time isn't quite the same everywhere. Planet Earth's hefty mass warps time. It's why the clocks on orbiting satellites run slightly slower and why astronauts on the International Space Station returned having aged slightly less, although not by much it must be said. That's an aside, but the big picture here is that space and time is warped by mass and because all the mass in the universe would've been contained in something smaller than an atom, it would've brought time to a standstill. Ergo, the beginning of time is the Big Bang or is it? 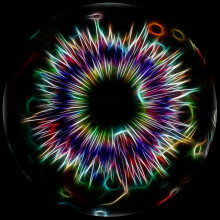 Huw - Well, there are cosmologists who think that the Big Bang wasn't really the beginning. What happened was that instead of collapsing like that, the matter bounced and so, people talked the Big Bounce rather than the Big Bang. It's a cycle of bounces and collapses. Graihagh - So then that means time is infinite and there is no beginning of time if it's continually contracting and expanding though. Graihagh - The message I'm taking away is, either you believe in the Big Bang and that before the singularity, there was no such thing as time. At that massive expansion, that is when time was created or you believe in the Big Bounce and that means time was infinite and there is no beginning of time. Huw - Yeah, I think those are the two basic options. But of course one of the nice things about science in general and physics in particular is that it has a delightful way of coming up with new options so we can't be absolutely sure that something else won't come along. Graihagh - Time was infinite then or it begins with a Big Bang, simple. But where do cosmologists sit? Is there any evidence that supports either theory? Roberto Trotta from Imperial College London gave me the lowdown of first was the Big Bounce. Roberto - This picture is actually in doubt today because we now know that our universe is not going to recollapse. It is actually going to expand forever. Graihagh - Sorry how do we know that our universe isn't going to recollapse? Roberto - And that's because of dark energy. 70 per cent of our universe is made of an unknown type of force or energy that we call dark energy, whose main impact on the universe is to make the expansion of the universe accelerate with time. So, not only the universe is growing with time today. It's growing at an ever accelerating speed and it will not be a big crunch that will end our universe. The end will be a state of darkness where all the matter will have been sucked into black holes. Graihagh - A slightly scary space. That sounds something of a sci-fi movie. Roberto - Yes, but it's about 200 billion years in the future so there is nothing to worry about. Graihagh - So, that theory is in doubt. What other theories might there be that have more support? Roberto - Some ideas are rather different. They postulate the existence of parallel universes effectively so. Our universe is made of a 3-space dimensions and 1 time dimension. So, it's a 4-dimensional universe. But what if there were additional dimensions that we cannot actually penetrate ourselves? Graihagh - Five dimensional spaces and universes being sucked into black holes. This all sounds a little mindboggling to me but fortunately, Roberto had some lasagne to hand to show me how parallel universes could work. Roberto - Okay, let's give our parallel universes 4 minutes. Graihagh - So whilst this quickly heating up, this is to demonstrate the various parallel universes, so you've got layers of vegetable because this is a vegetarian lasagne because this is a vegetarian lasagne I noticed. And then you've got the layers of pasta and cheese. So, what signifies what here? Roberto - The layers of pasta are going to symbolise and represent the different parallel universes separated by something which in this case is the vegetable filling. You'll have other layers which are just universes just like us, but they are separate from us across the 5th dimension and that's the dimension where the stuffing resides. So now, we're going to cut the lasagne in the middle to reveal nicely our parallel universes. Yes, we can see there are about 4 or 5 parallel universes in it. Now, the idea is that if we have gravity leaking through the two lasagne layers, the two pasta layers would be smashed together. They will be attracted one to the other and when they hit like this, they're going to splash all the sauce out and this is going to be the Big Bang effectively. Graihagh - If this theory is correct, it means not only are there an infinite number of universes but also, time too is infinite. But that's a big 'if'. Will we ever know for sure? Roberto - It's very difficult to say. I think it's actually quite impressive to be able to say that we can now reconstruct with a high degree of fidelity the history of the universe from today, 13.7 billion years after the Big Bang to the very beginning some 10-32 seconds after the Big Bang. All that remains to be tested is this tiniest sliver of time 10-32 seconds after the Big Bang. And so, in a sense, the job of scientists at the forefront of research is always that of pushing back the limit of the unknown. And so now, we are really hitting the very hard, very deep, very fundamental questions. Graihagh - What existed before the Big Bang? Well, it's still an open question. Perhaps nothing, perhaps another universe or perhaps a different version of our own, perhaps even a sea of universes. This is one problem that won't stay dead. In the decades following Einstein's death, the advent of quantum physics has resurrected questions about the pre-Big Bang universe. And no doubt, with many more additional discoveries to be made in the next century, our ideas may well be very different in the decades to come. Everyone enjoys an experiment. That's particularly true of Georgia Mills when she got Chris Smith to walk on eggshells. Georgia - We're going to test the strength of eggs today and see if they together can support your weight. So, I've got a standard 6 eggs carton on the floor with 6 eggs in it. I haven't done anything to them. I've checked that there aren't any cracks in them and that's all. You're going to stand on them now. Chris - This is this sort of cardboard carton that you'd get from the supermarket and there are 6 rather nice looking eggs in there and you want me to just stand with one foot to stand on that. Georgia - Yes. It will be a shame if this goes wrong, but I have faith in the structural integrity of these eggs. Chris - I have taken my shoe off. I'm putting my socked foot on top of the eggs in the egg box. Georgia - And now, I want you to make sure your weight is evenly distributed across all of the 6 eggs. Chris - Okay, I'm going to put my arm on you, just so I can just stay stable. Chris - Okay, you wouldn't believe it and I'm very nervous doing this, but I'm standing on one leg, on one foot, on a box full of eggs. I'm genuinely doing that and they haven't broken. Georgia - I'm just as surprised as you I think. Chris - I'm very relieved. Honestly, I thought that my feet were going to go straight to them and I was going to have a very eggy sock. Georgia - That's the amazing property of an egg. If we did this on their side, this wouldn't work at all. Do you want to try that Chris? Chris - I'm not doing that, but let's just grab an egg. So, these really are genuine eggs. They're not hardboiled or anything. I can shake it. I can feel the sort of yolk and stuff slushing around inside. So, what's special about this that I can stand on it in that way? Georgia - Eggs have a really good shape for this kind of compression. If you look at them, they're ovals. They're like an arch shape and we use this kind of shape in architecture all the time. you think about bridges, you think about domed ceilings. If you push on the top of an egg because it's such a narrow arch, the force is distributed all throughout the body of the egg. Meaning, it won't break. However, if you put a smaller force on the long edge of the egg, this actually squeezes in the inside of the egg as well and the eggs are really bad withstanding this kind of pressure. Chris - What you're saying is, this egg is - because of its shape, when I apply force to the curved top of the egg, basically, I'm compressing all of the material in the egg in all directions. It's sort of transferring the force down all of the sides evenly whereas if I turn the egg on its side and I were to stand on that and I'm not going to do it - much to your disappointment, I won't be doing that. But if I were to stand on the side of the egg, then I would be bending the shell a bit and there wouldn't that transfer of load all over the egg. It would just basically bend the shell and it's not very strong when you make it stretch. It's going to bust open. Georgia - Exactly, which is why when you crack an egg, you do it on the side. You'd never do it on the top. Chris - Did eggs evolve to have this shape for that reason? 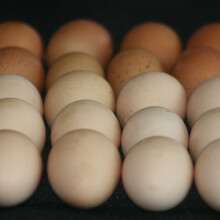 Is that why the egg has got this property to stop the chicken literally cracking its own eggs? Georgia - That's right. So, when a mother hen sits on her eggs, the last thing she wants to do is to squish all her babies. So, with these eggs pointing upright, it distributes her weight all around. But then when these tiny weak chickens need to get out, a small force on the side of the egg enables them to crack out of the egg. 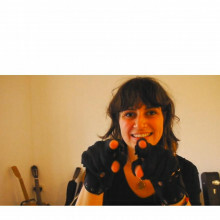 The Mi.Mu gloves control music with gesture and Connie Orbach was lucky enough to try them on. What do you do when someone hands you there favourite toy? Crash it of course! Simon - Drones themselves, as a thing that you can buy, a commercial product are only a few years old. But as mobile phone technology made chips available that are fast and good accelerometers, that's made possible smaller and smaller drones. 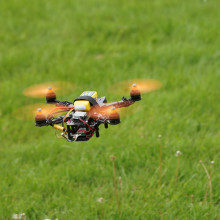 At some point about 2 years ago, people realised that you could build these small carbon fibre drones with good quality lithium-polymer batteries and they were really, really fast, and then people just started racing them. Georgia - How did you get into racing? Simon - I saw a video on YouTube when I was snowboarding once and somebody just like absolutely flying through the trees and it reminded me of Star Wars, the pod racing or like flying speeders through the forest and I was like, "I just have to do that." So, I think I ordered all of the bits on that first weekend and then built my first one. Georgia - How do you go about building a drone? Simon - You watch a lot of YouTube videos. Everybody who flies drones at the moment also builds them. There aren't really any off the shelf, ready to buy racing drones yet, although they're coming. Even if you buy one off the shelf, the first time you crash it, you're going to have to rebuilt it and crashing and rebuilding is part of the hobby or part of the sport so far. Georgia - Is there any element of software to it? Simon - The drones will have a little computer chip called a flight controller. That runs an algorithm called the PID loop and there's a few different implementations of the PID loop. The one that we all fly is called cleanflight. It's built by a British programmer called Dominic Clifton. So yeah, you can download the source code for this. They're all open source. If you know programming, if you know a little bit of C, you can download the source code and just hack on it and make it do what you want. Georgia - I see you've got some here laid out on this table. There are a variety of sizes, all of them have 4 sticky-outy propellers on them. Can you tell me a bit about these guys? Simon - This is the Thug 180. It's made by thug frames. This one here, I call The Nerd because I kind of designed it myself and it looks like it's got glasses on and the camera in the front of it is the nerd-cam. Georgia - The Nerd is the one that can see in 3D. I'm quite excited to see one of these in the air. Can we have a go? Simon - Yup, let's do it. So, you'll put these goggles on here. Georgia - What are these goggles for? Simon - This receive the picture from the drone so you see what the drone sees. Georgia - Wow! So we get a drone's eye view of the flight. Georgia - And I see you've got a spare. So you're going to take me along for a ride. Simon - Yup, absolutely. So, you'll see the same thing that I'm seeing. Georgia - Oh wow, that's so weird! So, I'm can see myself through The Nerd vision, as it were, with the goggles. Simon - So, what I'm going to do is, I'm going to fly for you now and you can just sit back and enjoy the 3D vision. Georgia - So we're just hovering in the air now, taking a look at - it's looking at Simon as he's got the controller and going really low. You can see almost each blade of grass coming towards you. This is quite frightening. I wouldn't recommend doing this on an empty stomach to be honest. Can I trust that you're not going to fly this thing into me? It's coming very close. Almost felt the breeze there as it flew past. Really picking up speed now, zooming along the ground. Oh! It had a 3D crash. Let's go and see if it's okay. Is it alright? Simon - Hit the grass and rolled. Georgia - Avatar's got nothing on this. A live 3D drone crash - it's amazing! Georgia - When is drone racing going to be in the Olympics? Simon - Soon, I hope. It's so much fun. There are so many leagues starting up. There's a big one in the US called the Drone Nationals which is bringing together the best pilots in the world and it's an amazing spectator sport too because everybody brings their goggles and everybody watches everybody else's race from the first person. So, it's like - imagine going to the Formula One races, but everybody can see the view from the driver's cockpit the whole time. So, it's really fun. Georgia - Is it all fun and games with these drones? Are there any other applications people have been looking into? Simon - We know people that are putting infrared cameras on drones to do search and rescue, so if there was somebody, a hiker, lost in the forest. Amazon is talking about using drones to do deliveries. I personally can't see how that's going to work. I don't think it's going to work in London. It's very hard to find somewhere you can safely drop a package off in London. Georgia - Is there any chance that people could hack in to drones? Simon - Sure, absolutely. I mean, I saw a tweet the other day that one day, we'll see a news drone chasing a police drone that's chasing a pirate drone that ripped off an amazon drone. Like we use frequency hopping an encrypted radio already so that we don't have to worry about people taking over our drones. But our video signals are still analogue. When we're flying, anybody can pick up our video signals. Simon - You don't drink and drone. It's one of the rules. Georgia - Well, there's nothing to stop a nefarious or drunk person flying into someone or even just spying through someone's window. Simon - People always say like, "Are you worried about people using drones to spy on people?" but my drones have never snuck up on anybody. They're so loud and they're so obviously in the air. There's a great device that's been invented that protects people from being spied on by drones. It's called curtains. So yeah, I don't think that's a real issue. I think that being hit on the head by a half kilo flying brick with spinning blades on the front is more of an issue than being spied on by something that's really, really loud and obvious. There are risks to them and it's a pretty unregulated industry or pretty unregulated hobby right now and everybody is very, very careful to make sure that we only do it safely and stuff, but like society is going to have to adapt. Georgia - So, can you program a drone? Georgia - I saw a video on YouTube of someone I think they had coded it to follow red and someone was running around with a red flag and the drone was chasing them. Is that possible? Simon - Yeah, absolutely. But the thing is, the image recognition stuff, you have to send a video back to a computer at the moment. As computers get faster, we're hoping to move more and more of those smart algorithms onto the microprocessor on the drone which will make them a lot more autonomous. If Moore's Law keeps holding and microprocessors get faster, we'll be able to move all sorts of interesting algorithms onto the drone. Like all of those crazy things like image recognition and face recognition and like following a particular car and all of that stuff will be able to be done on the drone once the processors are fast enough. 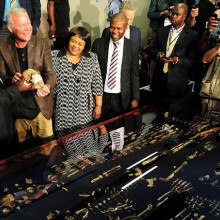 In September a discovery was made that will change history book but who were Homo Naledi and what do they mean to us? John - If you look at Homo naledi from some distance, they would stand about 1.4 meters high, the size of a small human. They stand upright. They're very thin-looking in build. As you look closer, you'll notice that there are some things wrong about them. Their heads are very small. Their heads are around a third the size of ours in terms of their brain size. Their hips are cast much more like a more primitive hominin, something like Lucy the famous skeleton. Their shoulders are sort of canted upwards in a way that we associate with some of the most primitive hominins. We think that that's probably related to climbing. But it's very clear that when you look at the details, the things that strike us as being so human-like. The feet, they're clearly adapted for walking long distances in the way that humans have, their hands, very human-like through the wrist and the palms. Their thumb is appropriate for humans in its length, but the fingers are very curved and that thumb is immensely powerful, something that we've never seen before in the fossil record. Their teeth, also really quite human-like in their size, in what they look like, they would have been suited for in terms of eating, but they have features in them that we've never seen before in humans or any other kind of hominin. Chris - Lee, how did you find them in the first place? Lee - Well, they were found as part of an organised search. I'd actually enlisted a former student of mine, employed him to actually been going underground in the caves just outside of Johannesburg. He in turn enlisted two amateur cavers - Rick Hunter and Steve Tucker. What that led to in mid-September of 2013 was Steve and Rick, entering a very tiny narrow passage, about 20 meters underground. It's about 17.5 centimetres wide, dropping down 12 meters into a chamber where they chanced upon this remarkable discovery. I saw the first photos on October 1st that led to a 60-person expedition that we launched on November 7th which led to the recovery of this remarkable sample of fossil hominins. Chris - When you saw that photograph, just describe the scene for us in that situation. What did you see? Lee - I was at home at night, 9:00 o'clock in the evening, working on some emails and the doorbell rang and there was Pedro on the other side. He said, "You're going to want to let me in." I almost didn't, given that tone. He came in with Steve in tow and they opened up this laptop and there sitting in the middle of this picture - was a man with lesser jawbone with this beautiful teeth that I could immediately tell were from a very primitive or ancient hominin. I cound tell by the shape of them. The next slide was that of a skull or at least half a skull embedded in the dirt of the ground. Just to say, we don't see fossils like that in Southern Africa. Most of our fossils are embedded in concrete-like rock. These are sitting in dirt loose. The next slide was more bones and I thought I was looking at a skeleton. I was stunned. I've never seen anything like that. Chris - Charles Musiba who's also a part of the team from the University of Colorado, when you look at those teeth, where did they fit in? Charles - When you look at those teeth, you realise that they're not modern humans. They have some features transitional between modern humans and some of our earliest ancestor. It's very interesting in that it may be signalling some completely different type of adaptation to maybe a different type of dietary behaviour which may not necessarily be exactly like ours. Chris - John, given where these specimens were found, how do you account for them being there? John - You know, this is the thing that occupied us as we were excavating. This is the largest assemblage of bone that we found for early hominins anywhere. We found them together with no animal bones other than a few little fragments. So, there's something very curious about the way that these hominins entered this chamber. There's no evidence that these bones were ever altered or chewed on by carnivores. It's clearly not some sort of predator that's dragged them into this cave. There's no signs of it at all. We've looked at the sediments within the chamber where we find them and we can show that those sediments originated within the chamber. They don't have grains that have come from the external environment and in fact, the nearby chambers don't have grains that have come the external environment. We look at that and we think it's very likely that the entrance to the chamber in the past was always pitch black and isolated from the outside environment. That explains why other creatures besides the hominins were not able to reach the chamber and it creates a problem in that, Homo naledi has to have been able to access the entrance of this and reach it inside with bodies. Chris - So, you're saying that these pretty primitive, small-brained individuals must have been intentionally depositing either themselves or their dead or dying in this chamber and then they remained in-situ for you to find potentially up to 2.5 million years later. John - What we were working on in here is a bed that's full of hominin bone and that includes articulated elements like complete hands and feet, things that would've been disarticulated rapidly if the bodies had not entered this chamber hole. We have got them in a situation where they could not have been washed in, where there's no evidence that there's a catastrophe that's happened to them, where they clearly entered the chamber over some period of time - we don't know how long, but not instantaneously. We can in other words, exclude the things that seem simple like some sort of catastrophic event, some sort of flood, some sort of predator that's a death trap that had them fall in. we're left with the explanation that Homo naledi itself must have been intentionally depositing bodies at the entrance of this chamber or into the chamber itself. 32:04 - Would you eat Nutella from a nappy? Would you eat Nutella from a nappy or would it be off limits? Ginny Smith surprised Kat Arney with this challenge. Would you eat Nutella from a nappy? Ginny - Now Kat, I've got a little experiment to try out on you to see how easily you're disgusted and our intern James and our guest Alison who are also here in the studio are going to join us for this. 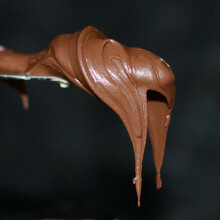 Does anyone like chocolate spread? Kat - Kind of yep. Yum a well known brand of hazlenut chocolate spread. Ginny - Very delicious. So who would like some chocolate spread? I've got some spoons here anyone like to try some? Ginny - Now I'm not going to hand you the pot because you can't eat straight out of the pot that's just not allowed. So all you have to do in order to eat some of this delicious chocolate spread is eat it out of the thing that I'm currently passing to you. So do you want to tell everyone what you've got there? Kat - OK so what I've just been handed is a disposable nappy that's full of Nutella. Now I'm not a mum but I'm a very proud aunty and I have seen nappies with this kind of content and this is just...I mean this is revolting. Kat - It smells kind of poopy. Ginny - Is anyone willing to try it, what about you two? Kat - This is a completely clean nappy? Ginny - I promise it's a clean nappy, I bought them today, but it looks pretty disgusting. Alison, you're trying it, how does it taste? Alison - It tastes like chocolate spread. Ginny - But did you feel anything when you were digging in with the spoon or was it OK? Kat - I can't do it. Alison - I think it was fine. A nappy is something that would have to be quite clean to go on a baby. I kind of trust the manufacturer to keep it clean and trust you to not play any nasty tricks on us. Ginny - And James how about you? James - It tastes fine, but it definitely still feels slightly strange. I'm slightly, not regretting but definitely wouldn't do it normally. Kat - I actually feel physically sick I'm not going to do it sorry. Ginny - So that's really interesting we have one who found it absolutley fine, one who managed it but it felt a bit weird and Kat who just flat out refused to even try it. Kat - I can't I can clean up people's puke that's absolutley fine. Poo, um I can't deal with it. 34:44 - How do we view the Kuiper Belt? The Kuiper Belt is a cloud of dust that is home to Pluto, but what else do we know about it? How do we view the Kuiper Belt? In August Graihagh Jackson did a whole hour on everyone's favourite planet- not-a-planet, Pluto and as part of that show she wanted to look into the cloud of dust that Pluto is part of - the Kuiper Belt. Scott Thomas was kind enough to show her around the skies at the Institute of Astronomy. Scott - The real claim to fame for this telescope was that it nearly discovered the planet Neptune. Scott - Yes, nearly. So, the story goes that John Couch Adams who was a famous astronomer who worked here at the observatory. He was an undergraduate at Cambridge. At that time, the planet Uranus had been known and there were irregularities in its orbits. So, it wasn't moving in a way that people thought it should. The obvious explanation for this was that there was something out past this orbit that was speeding it up and slowing it down. And John Couch Adams got wind of this idea. He spent his entire summer holidays just trying to calculate the position of this planet. Graihagh - And they lost. Scott - Yes. Unfortunately, the French, they took their calculations, they opened up the telescope and I think within an hour, they'd found it. They were both lucky and they had slightly better maps, I think. Graihagh - So to me, it kind of looks like scaffolding where it's some elaborate scaffolding on a slant. Where is the actual telescope? Scott - The actual telescope the bit right in middle there and you can see the eyepiece down the bottom and then at the top, we have a very sophisticated lens cap, which at the moment also includes a plastic bag to keep it dry. Graihagh - So, you say the lens is at the bottom. So does that mean you lie on the floor to look through it. Scott - Yes, you do. So, there's a big observer's chair here which is a sort of wooden structure that extends out to the side of the room and it rolls around. Graihagh - Do you get a duvet as well, and a pillow? Scott - I've often wondered about this because I can imagine in the middle of winter, it must be freezing and the middle of winter is the best time to observe. So, I imagine you'd wear some pretty heavy duty clothing. I think you should go and sit down. I'll open up the slit. Graihagh - Wow! So, the whole roof is moving and with it, the slit is moving around to meet my every need. Scott - You adjust the focus just by pulling this bit in and out. It really is very difficult to stress just how much easier it is doing this on a modern telescope. I'll be honest with you. I have no idea what I'm looking at at the moment. Graihagh - We need a star chart. Scott - We're do need a star chart. Anyway, that's sitting nicely in the frame there. Graihagh - I can't see anything. Scott - The cloud is coming! Scott - You might still be able to something. Graihagh - Maybe I'm just blind. So other than the lack of star shots and obviously a bit of luck, these objects are extremely difficult to see. So, what about things beyond Neptune and let's say, Uranus, how are you supposed to see them? Scott - With a telescope this big, it's very difficult and in fact, what a lot of people don't realise is just how small these things are and how dim they are. So, to spot these things, you need a very large telescope, you need a very high resolution camera. 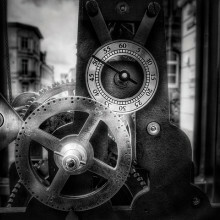 The tricky bit actually can often be - you need a long what we call an integration time. So, doing astronomy is kind of like trying to catch raindrops in a bucket where the raindrops are the photons, the raindrops are the light. You can make your bucket bigger which is using a bigger telescope or you can leave the bucket outside for longer, and that's the integration time. That's the time that you look at something. So, this means that while we can get really gorgeous pictures of things like other galaxies that we know stay very still in the sky, an object that's moving or an object that's faint that we're not really sure what we're looking for can be a lot harder. Graihagh - The stuff beyond Pluto then, what is it and if it so dark and doesn't reflect much light, and it's really hard to see, how did we discover it in the first place? Scott - So, the Kuiper belt is - well, you know the asteroid belt, right? Graihagh - Yeah, the group of icy blocks beyond Mars. Scott - Exactly. So, the Kuiper belt is the edge of the Solar System version of that, just like the asteroid belt is made up of all these chunks of rock that never really made it to form a planet. The Kuiper belt is the stuff beyond Neptune that never really made it to form a planet. So, as for the question of I guess, how do we know whether the stuff is out there, dwarf planets like Pluto, these planets, we can see. Unfortunately, you can only see them with a bigger telescope than this one obviously which is why a lot of them were discovered until relatively recently. Smaller objects are trickier but we do have some information there because even if they're very small and very faint, one of the really interesting things about Kuiper belt is that sometimes things fall inwards from it. Scott - I'm sure you'll be aware that there are some very famous comets, for example, Haley's comet. Comets like this that have - they're called short period comets - they're thought to come from the Kuiper belt. Graihagh - How did it suddenly go from an object to becoming a comet? Scott - One of the really interesting things about all the stuff out there beyond Pluto is that because it was formed when the Solar System was coalescing and was in its infancy, it never necessarily had the chance to settle down into stable orbits. So, a lot of the stuff that happens out there can be quite chaotic. Perhaps you get a big object passing through that perturbs these things and sends them swinging in towards the centre of the Solar System. Perhaps something happened early in the Solar System's formation that sent these things out on very long elliptical orbits and perhaps this is why we see them coming past every so often. In October we spent a whole month planning our Naked Scientists trip to Mars, here's a snapshot of what we got up to. Sue - I expect I look like a St Bernard dog. I can feel my hands really pressurised. It's difficult to lift my hands. That feels like you've done the biggest roller coaster ride ever. Connie - To the hundreds of silent workers who put our heroes in space. Libby - You've got the engineers who design these things. There are the people who built it, there the medics, there are doctors, there are the lawyers, there are the people like myself looking after the education programme. The list is truly endless. Connie - Even the bravest astronaut may still quake in their boots when they hear the journey conditions. Stanley - Well, imagine turning off the gravity and turning on the shower. Water would go flying everywhere. So, if you want to take a bath, it's going to be a sponge bath. Connie - Oh, and all the other hazards. Paul - Probably, the main consideration is the radiation environment. We're leaving the protection of the Earth's atmosphere and you are then subject to the full force of solar wind and cosmic radiation. We're well aware of the effects of radiation on the human body. It does not do nice things and you've got to fly through that for 9 months. Connie - Once there, there's a whole host of new problems especially if you want to stay for a while. David - If we want to survive, we go somewhere that's warm and cosy and has resources. If you want to go somewhere warm, that's rather incompatible with finding somewhere where there's accessible ice if you want water. Connie - Finally, if we've worked out all of that, we're going to have to consider the long term impacts of settling on Mars. Tony - Whereas it may be the case that the initial settlers could come back to Earth if things go badly. 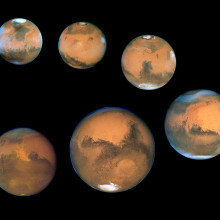 For those born on Mars, it's extremely unlikely that their physiology could cope with a return to Earth. Their bone density wouldn't be right for it. so, we have to get this right. Computer coding and music seem like they're worlds apart but actually they're remarkably compatible as Kat Arney found out this summer. This summer we did a whole show on computer programming in front of a live audience in Cambridge. Other than being more than a little stressful for just about everyone involved, it was also huge fun. It was particularly great when Kat got to explore her musical interests with Sam Aaron, the man behind Soni Pi; a programme that can be used to code music. Sam - I mean, we've just heard about how important it is to get people to code. In my opinion, it's not just about getting people to be professional programmers but also use code to express themselves. In the same way we write and read, we write diaries, we write poems, we could also use code in the same way to express ourselves in really exciting new ways. And so, Sonic Pi is software which allows you to write code, basic words, press a special magic button and hear amazing sounds. Kat - As a musician, I'm really excited by this and I know a lot of computer musicians, they're using programs like Ableton and things like that that cost hundreds and hundreds of pounds to make music and often, I play with them. So, how is this different? Why did you make this? I mean, I downloaded it earlier for free. Sam - Absolutely. So, you heard Eben earlier talking about lowering the barrier to entry. 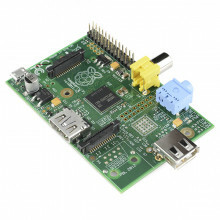 I mean, part of the deal about the Raspberry Pi, it's extremely affordable. And so, the software I've written is also extremely affordable. It's entirely free. And so, the idea is, if you don't have any money, it doesn't matter. You can use the software. Also, it runs on all computers. It runs on a Raspberry Pi, but also runs on a Windows or a Mac. So, if you already have a computer, use that, but if you don't, then get one of these Raspberry Pis because they're really wicked fun. Kat - Now, is this just a way of basically tricking kids and tricking even adults into doing a bit of coding or is it actually genuinely a musical tool? Could you make musical compositions that would stand up on this? Sam - I mean, is writing poetry tricking kids into grammar? Right? Clearly not, right? So, this is not tricking people into making code. Kat - Maybe a little bit. Sam - Code is an amazing expressive form and it's just shown people that potential. And yes, Sonic Pi is a new musical instrument that you can use today to perform in nightclubs and venues to make music and it's a lot of fun. Kat - Right. Well, enough talking about it. Let's see it. So, we've got a computer screen up. We got a little Raspberry Pi sort of naked circuit boards sitting there. And on the screen, I can see just some lines and lines, and lines of code. They look like words, sleep, bit, crusher, soul, sustain. What is this? Sam - Yes. So, I'm showing you here one of the examples. So, when you start up Sonic Pi, you have a help system. The help system contains a bunch of examples. This is one of the pre-canned examples just to show you what you can do with the system. So, shall we hear it? Kat - Yeah. Let's play something. Sam - Let's give it a go. Sam - So we're getting some of that dance music. This is all generated in real time on the Raspberry Pi using lots of fancy mathematics to make the sounds. The synthesisers are all real time generated. So, this little Raspberry Pi is an extremely capable machine, it's able to do this. So, I use the same system to perform on stage at night clubs. Kat - That is incredible. It's kind of pumping. We're all like, "Come on. Hands on the air people!" Sam - They're going wild. Kat - Reach for the lasers. Sam - Calm down people! Calm down! Kat - Never thought I'd say on the radio. So, what have we got going on here? So it's making drums and synths and all sorts of things. Sam - Absolutely. So, shall I show you how to get started? Kat - Okay, let's have a go. Let's make a tune, banging tune. Sam - So, the first word to learn in Sonic Pi is the word play because we're playing a note, but also playing. We're having fun, right? So I write the word 'play' and then I choose a number to play. Let's choose 80. We hear a little beep. That's it. That's your first programme. How easy is that to write? Sam - So, once you write your first programme, the next thing is how to change these things. So now, we can change this number 80 because numbers can go up and down. Notes can also go up and down. So, if I chose a lower number like 60, you get a low note, right? Kat - Yes. It's much lower, okay. Sam - If I'd said 90 I'd get a higher note, right? So, done. So now, we can play all the notes we can imagine then we need a way to make a melody. So, if I play note 60 then I need to have a way of saying, "Well, wait for a bit. Let's sleep for a second and then play another note. Play 65, say and then let's sleep for half a second and play 72." So this way, we're able to play different notes and make a little melody, right? Kat - I like that. Sam - At this point, with these two commands, 'play' and 'sleep', we can play pretty much all western notation. So, if you take any Bach, or Mozart, or Beethoven with two commands, you can reproduce those things. It's not slamming beats yet, but we've already done classical music. Kat - Okay. Can we make it a bit more funky? Can we get it kind of going? Sam - So, the next thing we do is once you got playing, we need some programming structures to help us to manipulate this stuff. So, I've invented something called the live loop. A live loop is just a thing which can loop. So, let's play a sample loop Amen which is Amen Break. Kat - Is that the Amen Break? Very well known. Sam - Sleep for the one length of that sample. Kat - That's what drum and bass is made of fans. Sam - And now we've got this loop going around, but whilst it's playing, I can now change the rate, say to be half, and now, we got it half and I can bring it back up to 1 again. I'm just changing one number here. Let's go reverse, minus one. Let's add some bass and then let's add some slicer to slice the volume in and out. So, I just choose where to start the slicer, where to end it. And so, just by adding a simple piece of code on top of another simple piece of code. Kat - I think we've got a number one hit here already. I mean, it's fairly boring and repetitive, but there you go. Sam - That's what dance music is. Sam - You have to be able to dance to it. So, you say it's fairly boring and repetitive, but we've only got 9 lines of code here. Kat - How long would it take someone like me to actually make a tune, a kind of a song with a beginning, a middle, an end, some structure? Sam - It depends on how complicated the tune would be. I went to a school in New Castle, Benton Park Primary School where they have a Sonic Pi Orchestra and they've been teaching themselves, the kids have been teaching themselves. And the primary school kids have been teaching their local teachers how to do the stuff. This is 10-year olds. Okay, so you just need some time and some creativity and some fun and some patience. In a few days, you can get the basics down and then depending on how much time you want to put into it, in the same if you want to learn a violin, how much practice you put into it, you can get to do some wicked things pretty quickly. Kat - Is there transferable skills from learning to write these kind of stuff? Sam - Absolutely! This system is written in the same language that Twitter was originally written in. Kat - And that's boring and repetitive. Sam - Using exactly the same structures as Twitter was originally written in. All the UK government work is all written in the same language. This language called Ruby. Kat - Also boring and repetitive. Sam - Absolutely transferable. But code is not boring. It can be repetitive, but the computer does the repetition, not you. Kat - So, we're going to have a little bit of time now. I want you to show me what you can do because you play in night clubs, don't you? You've played this stuff out and people do dance to it. Sam - Absolutely, yes. So, let's choose one of the examples in a way to start. So, this is an example called ("Tilburg")(music playing). So, this is going and so, I've got my basic tune around. It's very hard to play that. I can't fully hear myself. Normally, these beats are bashing out. So, I can turn the randomization off. Kat - I do like my house music and this sounds pretty good. Sam - It's nice, yeah. I start and stop it. Sorry, I made a mistake. So, you can make mistakes all the time. It's totally fine. So turn off bits, turn of the bass drum and then get the rhythm going again, and then drop a kick in again. Now, off we go. So, all I'm doing there is editing some very simple lines to make that happen. If physics were music what would it sound like? Domenico - What we're listening to is the result of a process called data sonification and data sonification is all about making measurements into something audible. So if you like, it's like using notes and melodies represent data instead of using conventional points and lines. Chris - Which data did you use? Domenico - So, in this case, we used energy measurements that were taken by physicists in 2012. So, what we are listening to is the distribution of the energy going from really low to high energies when the Higgs was actually discovered. Chris - I see. So, when you see a collision happen, those recordings that were made in the detectors at CERN, they've given you that data and you've done something to it to turn it into a tune. Domenico - Exactly. What we did to the measurements was mapping them or basically associating to each single measurements in each single number a music note using an algorithm. So, a set of rules that are actually linking the data to the music notes and giving a melody. Chris - There's only a small number of notes but the energy levels must have been a continuous variable. It must have been over a huge range. So, how do you turn something with many, many possible energies into a discreet number of musical notes? Domenico - What we did was actually using a mapping process that was compressing the range of the energy variation to a certain number of octaves in music terms. So we had an orchestra, we had instruments really able to play really low notes like double bases, to instruments able to play really high pitch notes like flutes and piccolos. So, we decided beforehand what was our range or energy range in sonic terms in some way and we did the mapping. Chris - You've got a real kind of orchestrated piece here though. It's not just individual discreet notes. So, how did you then add the extra layers of orchestration? Did you apply one rule for one set of instrumentation and another set of rule for another, and then get something that sounds good? Domenico - That was indeed a possibility. So, what I prefer to do was taking the energy measurements and create one single long melody, really long one. And then I was listening to it and I was extracting pieces of this long melody that was sounding particularly nice. so, it was particularly suitable for an orchestration. As a composer, what I like to do was actually using the right pieces for the right instruments. So, I actually started working, trying to imagine how these little pieces could layer on top of each other. I work on my orchestration to tell a story. And the story I wanted to tell was how the discovery happened. So, working from low energy, low frequencies, double bases and Cellos at the beginning and having it building up with woodwinds and with horns, sustaining the melody and finally the big discovery. Chris - Could you use the same technique to do other data? Presumably, you could. Domenico - Indeed. So, data sonification is a really, really general technique. We can actually use it to represent whatever we like. For example, I was recently involved in a research actually using data sonification to help doctors to discriminate between healthy and potentially dangerous cells in cancer so actually using sound to discriminate between healthy and unhealthy situation. Chris - Where previously, they would look down a microscope and try to discriminate visually, you would have a computer reader slide and translate what it's "seeing" into sounds and then the doctors using their ears to discriminate rather than exclusively their eyes. Domenico - Exactly. The reason why we are doing that is because we believe that ears can be much better than eyes in discriminating anomalies and discovering patterns. So, in some sense, the hearing sense is a neglected one. Wwe are so much relying today on looking at graphs and looking at visual representation of information that we forgot that we can actually use other senses. Hearing is one of the best ones. We have one of the most complex way of detecting patterns embedded in our ears and we're not using it. Chris - I suppose this is the audio equivalent of creating a graph. If I've got a complex series of numbers and I want to represent them in the way that makes them easier to interpret and to show what the trend is, I draw a graph. You're doing the same thing with music for big data sets. Domenico - Exactly. What we are hoping to do is actually, using the natural capability of our ears in detecting trends and patterns and anomalies. One example I really like is when we think about a graph and we think about lots of points in a graph, sometimes it's really, really difficult to identify one misplaced point in a graph. If we think about a melody which has a lot of notes and really complex is quite easy actually to spot a wrong misplaced note in a melody. That's all because we are so good in detecting anomalies in patterns using our ears. Previous Do You Have Skinny Genes?